After a significant break, last week the Romans returned to Coventry. Today little is visible today of the Roman presence in the region: the most noticeable remains are the Lunt Roman fort (remarkable for the presence of a gyrus or training ring for horses) built in c. AD 60 in connection with the revolt of Boudica. 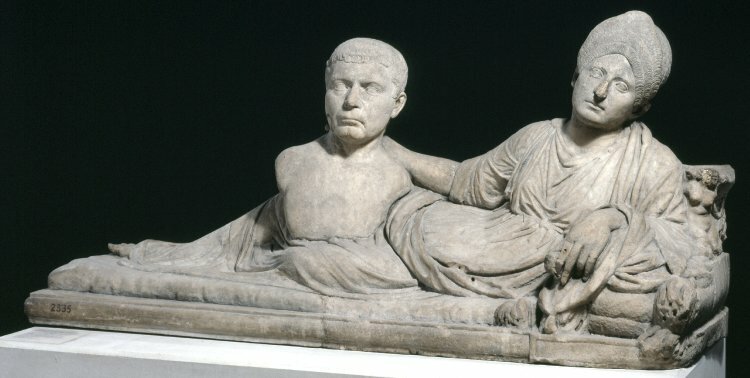 The travelling British Museum exhibition Roman Empire: Power and People currently on display at the Herbert Museum in Coventry, however, reminds us of the Midlands’ Roman past. But more than this, the exhibition invites us to contemplate the everyday experience of the Roman Empire, and how we as experts might best communicate this to the public. The travelling exhibition combines objects on loan from the British Museum with Roman artefacts from local collections. The British Museum crew has not held back: some of the objects are of interest even to experts in the field. 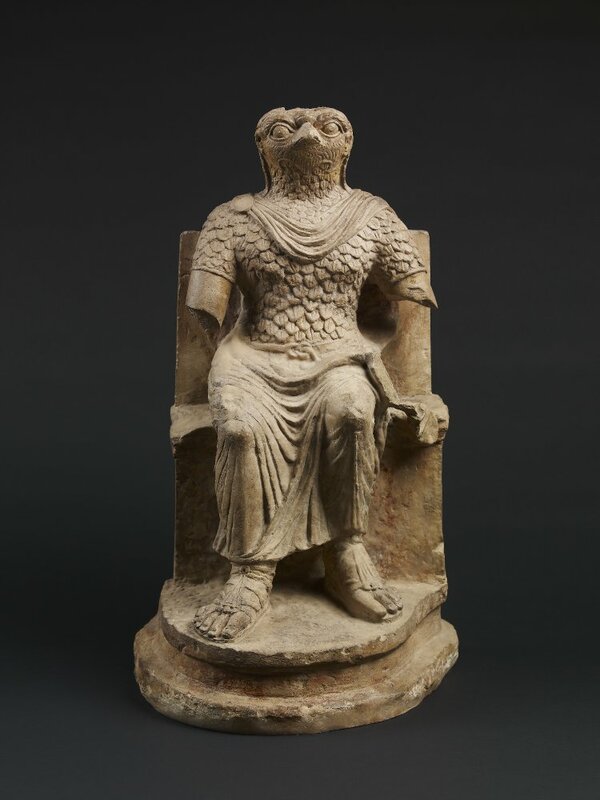 The statue of the Egyptian god Horus dressed in military attire (right), for example, is a wonderful embodiment of ‘Roman’ meets ‘local’, something that the exhibition more broadly aims to capture. Students of Roman visual culture will also appreciate the funerary monument of the early second century AD (below, middle) which shows a woman holding a bust of her husband; an object that, for all her visits to the British Museum, this reviewer has never managed to spot before. 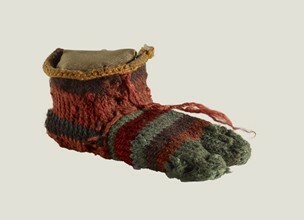 Since the British Museum pieces form part of a special temporary exhibition, it is also an opportunity for scholars to see objects that would never normally be on permanent display due to conservation reasons: the well-preserved child’s sock (below, bottom) from Egypt is one of these. These and other pieces are displayed alongside Roman objects that have been found in the Midlands (differentiated from British Museum pieces by their green signs), including a wall painting from Leicester, a lead pig from Tripontium and, of course, finds from Lunt. It is the juxtaposition of local finds alongside impressive pieces of Roman culture that probably forms the most intriguing aspect of this exhibition. As the exhibition travels throughout the UK (and perhaps internationally), the display spaces and the combination of objects will change: the local objects chosen for display in Coventry, for example, differ from that already shown in Bristol or Norwich, and will change again as the exhibition travels to Leeds, Dundee and Segedunum. In this the exhibition probably mirrors the experience of the Roman Empire itself, in that ‘Rome’ and the ‘Roman Empire’ were always (re)configured at a local level, resulting in divergent experiences that nonetheless had commonalities. Moreover, as the exhibition moves local museums are making their own contributions to what goes ‘on tour’: Bristol has added a ‘Romanopoly’ game, and Coventry has developed a ‘Make your own denarius’ interactive display (see #CovgoesRoman) which this blogger hopes will join the show as it moves on. Thus, again like the experience of the Roman Empire, each locality makes their own contribution to Roman Power, whether this was the original intention of the organisers or not. The locally discrepant experiences of the Roman Power exhibition, the way it entangles ‘local’ and ‘global’, and the active contribution of cities throughout the UK to the experience, makes it, in this authour’s opinion, an ideal medium for conveying the everyday experiences of the Roman Empire and the way Roman culture and ideology formed. The exhibition, in this way, goes beyond the objects to also communicate processes. Indeed, this sort of exhibition makes one wonder whether this is a better way of experiencing the Roman Empire than the more traditional displays housed in the British Museum itself. This Guest Blog was posted by Clare Rowan, a Research Fellow in the Department of Classics and Ancient History at the University of Warwick. She is more frequently to be found blogging on topics related to Roman coinage, and is a regular contributor to the Coins at Warwick blog. Clare will be giving a talk in association with the exhibition on the 10 July entitled Coinage and Communication in the Roman Empire. If you would like to write a guest blog for TRAC then why not get in touch? We’d love to hear from you, and to share your thoughts with the TRAC Community! I should also reference the Herbert Museum Website for those who wish to book tickets in advance (discounts are available). Many thanks for this post, Clare! I definitely want to visit the exhibit, and will do so when it comes to Leeds and/or Segedunum. Unfortunately, I’ll have to miss your talk at the Herbert. Would you consider sharing parts of that talk as a future guest blog here? Sorry you won’t be able to make it. I’ll wait and see what material I come up with for the talk before I commit myself to blogging about it! But there are coins and hoards in the exhibition, so plenty of material for a coin talk….